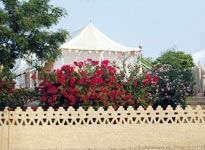 Rohetgarh, once the desert home of the Rathores, has now undergone refurbishment as a heritage hotel. Conferred on Thakur Dalpat Singh I for his deeds of courage and his military campaigns under the Rathore banner, Rohetgarh soon graduated to become one of the most important fiefdoms of the Marwar state. 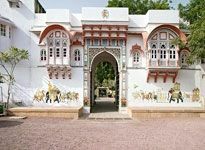 At Rohetgarh, there are a number of activities that the visitors can engage in. This includes the Rohat safaris, the village safari, royal picnics, bird watching and culinary workshops. The hotels the Rohetgarh are all set to meet the travel requirements of the guests in the most satisfying way. 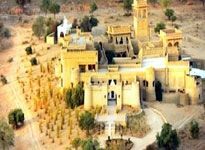 The Rohetgarh Fort Hotels is the most favored and popular of all hotels in Rohetgarh. Supervised by the royal family, sporting a traditional look and extending a royal welcome, this hotel in Rohetgarh transports you to the glorious days of the past era. The guests are welcomed into the exquisitely appointed guestrooms that are done up in different color schemes and are complete with the modern in-room amenities. The guests at this hotel in Rohetgarh can enjoy a royal treat at the hotel's on-site restaurant that whips up Continental and Indian dishfuls that are finger-licking good. Here the guests can look forward to a number of diversions that will help them lessen their boredom. These recreational activities include jeep, camel, horse safaris to desert and tribal areas, music and dance performances.